Teeth whitening is an innovative concept that can transform your life. Over the past few years, teeth whitening has become even more popular and more of an aesthetic concern in our society. Having pearly white teeth is one of the most important parts to be concerned about. It is actually a reflection of your hygiene and cleanliness. Also you would not like to wear a shabby smile and see people pointing out at you and passing lewd remarks. If you have already been through such an indignity of wearing a dull and patchy smile and have sworn to yourself that you would never ever smile once again, it’s time for you to breathe easy. Do not give up hope my friend. There are many ways to get back the whiteness of your teeth and smile once again. With the latest teeth whitening treatments available today you would not feel the need to bother about your dental hygiene any longer. But, prior to that you must learn what is teeth whitening and what does the process involve? Teeth whitening is basically a dental procedure that helps in removing the stains and marks from the outer layers of the teeth, thus giving you bright, white teeth as you always had. It is one way of restoring the original color of your teeth. There are many products and procedures available today for teeth whitening including toothpastes,teeth whitening gels, teeth whitening trays and in-office procedures etc. All of these treatments are equally effective and safe for your dental health. But, Why Do We Need Teeth Whitening Treatments? Well, we need these treatments because over the time our teeth lose its original color due to the foods we eat and the medications that we take. As a result of this, our teeth tend to develop two types of stains – extrinsic and intrinsic. Extrinsic stains are caused due to over-exposure to certain foods and dark-colored vegetables. Also, it includes tobacco, soda and regular wear and tear as some of the probable causes. Extrinsic stains aren’t really difficult to treat as they can be removed by brushing or dental cleaning. However, if you have developed stubborn stains, you might require teeth whitening. Intrinsic stains, on the other hand, are formed inside the teeth. These stains are caused due to trauma, medicines like tetracycline and aging. These stains are often caused due to excessive fluoride ingestion. Intrinsic stains were earlier considered to be the most difficult stains to be recovered with teeth whitening. However, the concept has changed today and experts now suggest that it is possible to remove these stains with the help of dentist-supervised teeth whitening treatments done for a period of a few months to one year. Therefore, the typical reason for discoloration of teeth are age, eating habits, smoking, tobacco, dark colored drinks, beverages like tea and coffee, chemicals or drugs and trauma. How Do Teeth Whitening Treatments Work? Usually, the teeth whitening treatments use peroxide gels or solutions as bleaching agents that help in removing ugly stains and discolorations from your teeth. The carbamide peroxide solution helps in bringing about the bleaching effect that eventually removes the stains and brings back the lost whiteness. As the peroxide chemical breaks down, oxygen gets into the enamel of the teeth, thus bleaching the dirt and stains efficiently. This helps in lightening the stains thereby removing the same completely without causing any damage to the teeth or the gums. Teeth whitening treatments can either be carried out at the dental office or at home with the use of at home teeth whitening kits.At home teeth whitening kits are available at varied ranges starting from $100 to $400. If you want significant change in your tooth color at a very short span of time, you can opt for the in-office teeth whitening treatments. This method of teeth whitening involves the use of high-concentrated peroxide gel that helps in cleaning the teeth and bringing back the whitening effect. An expert cosmetic dentist along with his staffs carries out these procedures in a dental office. The dental offices offer a comfortable environment for the patients. With the use of state-of-the-art technologies and advanced equipment these processes are performed to produce immediate results. As a patient enters the dental office, he is made to relax in a comfortable ambiance. A rubber shield is placed on the gums for protection after which the peroxide gel is slowly applied on to the effected parts of the teeth. Next, a beam of high frequency light is passed through the teeth for activating the process of whitening also known as laser teeth whitening. This method is repeated for a couple of times after which results can be seen within 60-90 minutes. The best part of in-office teeth whitening treatments is its speed, but it is very expensive as well. A single in-office teeth whitening session usually costs around $650 on an average. The best in-office treatments are Zoom!, Opalescence and BriteSmile. People who do not feel the need to spend so much for a teeth whitening session can opt for the at home dentist supervised teeth whitening treatments as well. These treatments are less expensive when compared to in-office teeth whitening but it takes about a week or more to show results. However, this method is more preferred because it can be done anywhere and anytime. These treatments involve the use of teeth whitening trays that is usually provided by the dentist after taking the measurements of your mouth. This helps in making custom-designed trays to fit inside your mouth and allows thorough teeth bleaching. After preparing the teeth whitening trays, the dentist offers the peroxide gel that needs to be applied onto the trays and worn for approximately an hour everyday over a period of 7 to 14 days, or according to results. The lower the percentage of peroxide used the longer it remains on your teeth safely. People feel free using this method as the trays can be worn even during sleep. 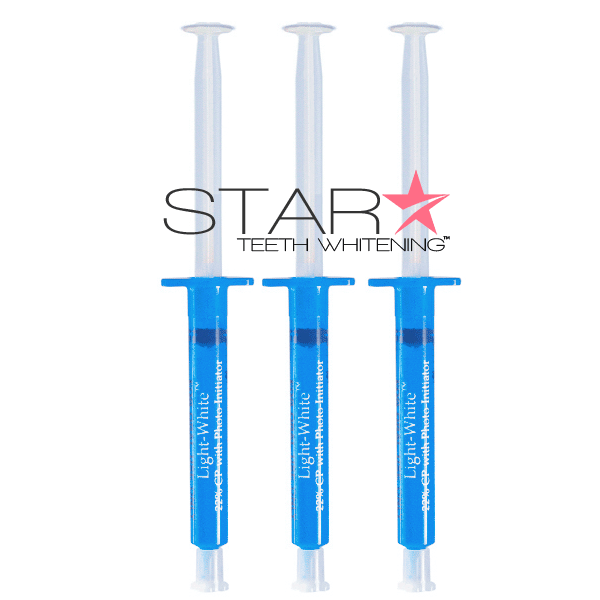 At home teeth whitening kits are available at varied ranges starting from $100 to $400. In-Office treatments can range between $300-$1500 depending on Dentist and location. Over the Counter methods include whitening toothpastes, whitening strips, whiteners etc. These typically cost $20 to $150. 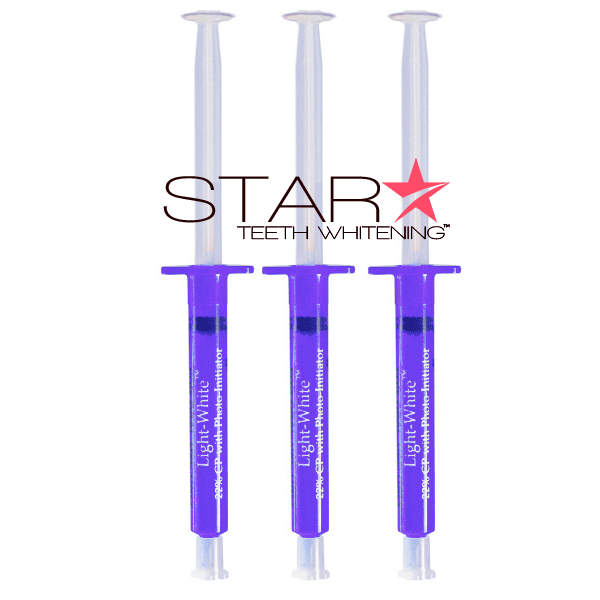 Star Teeth Whitening™ is the first and only online Dental company named one of the industry’s “Best Teeth Whitening Gels” by Cosmetic Dentistry Reports. 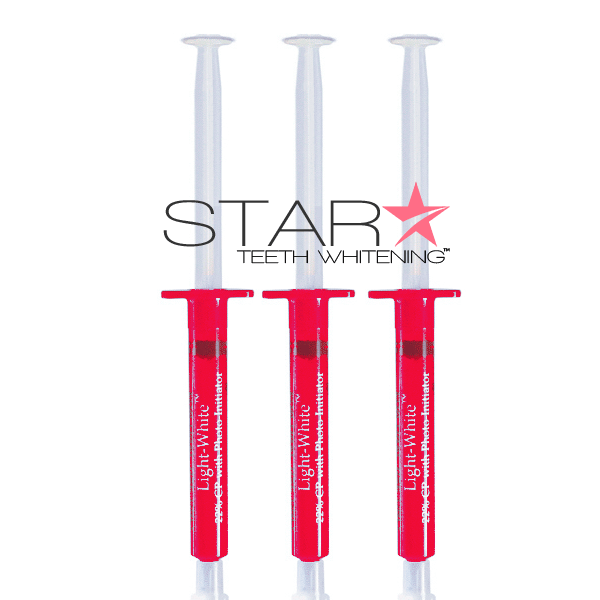 Star tooth whitening gel was formulated by world renown Cosmetic Dentist, Dr. Georgio Vatelli DDS. 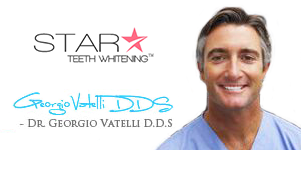 We are the first Cosmetic Dental Company to offer direct teeth whitening from Dr. Vatelli’s office to your door.